In late 2009, the Ugandan parliament introduced a bill that would allow life imprisonment of homosexuals, and in some instances, the death penalty. Though the bill expired after having been tabled for two years, the Ugandan parliament passed a similar bill in late 2013. President Yoweri Museveni, after some hesitation, signed the bill into law in early 2014. Though it may appear as if the president and parliament were just acting to meet the demands of the Ugandan majority, there is much more going on in the background. In the battle over LGBT rights in Uganda, those in favor of the bill have received support from American evangelical missionaries. On the other side of the debate, those against the bill have heard support from international groups and individuals, including U.S. President Barack Obama. 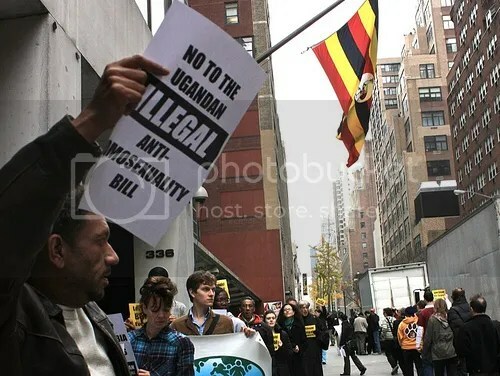 Indeed, it appears that this is not simply Uganda’s fight, but also represents an international “spillover” effect from the ongoing debate over LGBT rights in the United States. Prior to the Anti-Homosexuality Bill introduced in 2009, homosexuality was already illegal in Uganda. The point of the bill was to go one step further and make “aggravated homosexuality” punishable by death. “Aggravated homosexuality” is defined as repeated homosexual behavior and/or homosexual behavior by people who are HIV positive. To many, this came as an extreme addition to an already draconian set of laws. The law outlawing homosexuality had been in place for nearly a century, so the sudden necessity of a new law suggests it is politically motivated; the old law is still an effective discriminatory instrument. A window into those considerations might be found in the fact that Minister of Parliament David Bahati, before introducing the bill, attended a meeting with evangelicals from the United States who promote converting homosexuals to heterosexuality through prayer. The timing was symbolic in that Bahati, when proposing the bill, chose to highlight a link between American evangelical influence and the bill, albeit indirectly. American voices also spoke against the legislation. Both Obama and U.S. Secretary of State Hilary Clinton were quick to warn the Ugandan parliament against passing the bill. Furthermore, Congress reacted by passing a resolution to advise Uganda and other countries against taking such extreme action against the homosexual community. If stern words from the American government were not enough to cause hesitation within the Ugandan leadership, others have raised the issue that the legislation might conflict with the African Growth and Opportunity Act, which allows participating countries to receive preferential access to U.S. markets. It then became a question of whether or not Uganda wanted to risk its preferential economic status in order to further suppress the rights of homosexuals. Ultimately, those speaking against the legislation succeeded in suppressing the bill long enough so that it expired. This, however, did not prevent increased homophobia in the country, nor did it prevent the resurgence of the bill in 2013. The Anti-Homosexuality Bill introduced in 2013 is very similar to the 2009 bill, though the punishment of execution was taken out, possibly in response to the outrage of international organizations. Despite the changes, the bill met similar opposition. Secretary of State John Kerry compared the law to apartheid, while the World Bank withheld a $90 million loan that would have gone towards improving health in Uganda. With these and other sanctions facing the nation, it would seem that the Ugandan parliament would have acted quickly to vote the bill down. This assumption seemed especially valid in light of a change of heart on the part of some of the American evangelicals. When the second version of the bill surfaced and gained traction, evangelical groups in the U.S. claimed they neither played a role in influencing the passing of the bill nor support its harsh punishments. Not everyone abandoned their support for the old position: pastor Scott Lively for instance, who gained support for the bill in 2009 continued to openly support the bill. At the same time, Bryan Fischer from the American Family Association mistakenly celebrated the passing of the bill in 2012 as a chance for the U.S. to do the same. That is, Fischer saw Uganda’s progress against the LGBT community as an example of what the U.S. could achieve. With such contradicting opinions from evangelical groups, and international groups taking a strict stance against the bill, it is surprising that the bill passed in December of 2013. In the end, it was left to President Museveni to decide the fate of the bill. At first, he was hesitant because a quorum was not present when the vote on the bill occurred; eventually he agreed to sign the bill into law if he could be offered proof that homosexuality was not genetic. After consulting a committee of scientists, Museveni signed the bill. He sent a letter to President Obama stating, “Their unanimous conclusion was that homosexuality, contrary to my earlier thinking, was behavioral and not genetic. It was learnt and could be unlearnt.”  The Anti-Homosexuality bill became law, yet neither parliament nor the Ugandan people offered any major opposition. Instead, the law seemed to reflect the will of the country’s Christian majority. Uganda’s population is 85% Christian, which gives power to religious officials in shaping public opinion, especially on an issue concerning sexuality. It is not surprising that religious beliefs openly overlap with politics and that a majority then is in favor of limiting the rights of homosexuals. It is quite possible the evangelicals used this to their advantage in supporting the bill. Evangelicals spread their message largely through broadcasting networks that air mostly religious programming. This programming is a mixture of moderate and more conservative belief structures that, to the audience, are nearly indistinguishable. Evangelicals use these and other networks to gain funds, which then go into social and religious programs as well as toward reinforcing the viewpoints of these groups. This task is made easy by the fact that the majority is already Christian. Why would parliament or the president refuse passage of the bill when the Christian majority wants it? Lydia Boyd makes the argument that the people are not only in favor of the bill because of religious beliefs. Boyd states that it is also because of a Ugandan mentality that promotes respectability and limits freedom based on the idea that too much independence causes problems within society. Though it is not clear whether it is religious beliefs or Ugandan mentality that is more prominent in shaping opinion against homosexuals, the two have enough overlap to help explain this common opinion. This opinion, regardless of the law, is a major factor in reducing the social acceptance of the homosexual community. When the law passed, a Ugandan tabloid responded by listing the names of 200 people it believed were homosexual. This caused Ugandans to act out violently against those listed, as well as other members of the Ugandan LGBT community. Even when the 2009 version was tabled, some Ugandans denounced the homosexual community, declaring them sub-human, threats to children, and “un-African.”  These declarations testify to the fear and hate Ugandans directed towards homosexuals, the sentiment providing a reason for the bill itself, and its passage providing reassurance for the outraged. In passing the bill into law, parliament was only working to mitigate the fears of the majority of the people. With the wants of the Ugandan people met, the question remains of the role of the United States in the debate over homosexuals in Uganda. Evangelical missionaries used religious and social values of the Ugandan people to promote and influence the passing of the bill, while the U.S. government appealed to Uganda’s existing trade agreements and need for aid. The fact that either of these groups played such a large role in Uganda’s debate is reminiscent of the debate over gay marriage in the U.S. The opposing sides are the same, but there are two main differences: the setting and the stakes. In the U.S., homosexuals were and are fighting for marriage equality. In Uganda, homosexuals were fighting to avoid life in prison. The outcomes, however, differ greatly. Before Uganda passed the Anti-Homosexuality bill, the U.S. Supreme Court struck down DOMA, moving in the exact opposite direction. Because of this, the U.S. has established a stronger platform to make similar advances on an international scale. It is not unheard of that the United States has used the conflicts of other nations to promote its values, but it is still uncommon for the U.S. to take such a solid stance when LGBT rights are concerned. It was only relatively recently that Obama came out in favor of gay marriage and what’s more, Americans, regardless of political party, are increasingly likely to support marriage equality. The country is making steady progress to the extent that its message of equality is spilling beyond its borders. If the U.S. government keeps up its support for the LGBT community, its efforts, though against the will of the Ugandan people, may yet stand as a precedent to continue speaking out against countries that discriminate against and diminish the rights of LGBT communities. Englander, Daniel. “Protecting the Human Rights of LGBT People in the Wake of Uganda’s Anti Homosexuality Bill, 2009.” Emory International Law Review. 25.3 (2011): 1263-1316. “New Anti-Homosexuality Laws Raise International Concerns.” Vax 12.2 (2014): 3. Ewins, Lucy Heenan. “Gross Violation: Why Uganda’s Anti-Homosexuality Act Threatens Its Trade Benefits with the United States.” Boston College International & Comparative Law Review 34.1 (2011): 147-171. “Listen, then Speak: Uganda’s Anti-Gay Bill is Making Cross-Cultural Relations More Complex than Ever.” Christianity Today 54.2 (2010): 53. Kaoma, Kanya. “How US Clergy Brought Hate to Uganda.” Gay & Lesbian Review Worldwide. 17.1 (2010): 20-23.